Ebook comes with main table of contents and interlinked sub table of contents. Ebook contains illustrations and inline footnotes where applicable. Each chapter is clearly marked so user knows which book within the boxset is being read. The Novels of Mark Twain. • Personal Recollections Of Joan Of Arc. 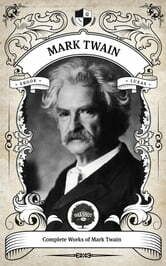 The Non Fiction of Mark Twain. • Old Times On The Mississippi. • Life on the Mississippi. The Travel Writing of Mark Twain. • Some Rambling Notes Of An Idle Excursion. The Short Story Collections of Mark Twain. • The Jumping Frog And Other Humorous Sketches. • Mark Twain's Burlesque Autobiography. • Sketches New and Old. • The £1,000,000 Bank-Note and Other New Stories. • The $30,000 Bequest, and Other Stories. • The Curious Republic Of Gondour, And Other Whimsical Sketches. The Complete Essays of Mark Twain. The Complete Letters of Mark Twain Vol1-6. The Complete Speeches of Mark Twain. The Biographies of Mark Twain. • Mark Twain A Biography by Albert Bigelow Paine. • My Mark Twain by William Dean Howells. • The Ordeal of Mark Twain by Van Wyck Brooks.